“Aunney, I Need Band-Aids!” is the newest book from Christian Faith Publishing author Debra M. Kelley and is a touching picture storybook about a little girl named Harmony and her tremendous wholehearted faith in God, which the narrator, Aunney, witnesses as she overhears Harmony teaching her dolls about how God healed Jesus’s wounds and how he can similarly heal the hearts of people everywhere. “Aunney, I Need Band-Aids!”: a tender children’s story about a little girl’s huge faith in God. “Aunney, I Need Band-Aids!” is the creation of published author Debra M. “Aunney” Kelley, a loving mother and grandmother who lives with her husband on a small hobby farm in Central Minnesota with their two dogs. Aunney Kelley shares a memorable sight, “A few moments later, I realize I don’t hear Harmony talking to her dollies. I decide I better peek into Harmony’s room to see what she is doing and make sure she is okay. I couldn’t believe my eyes! ‘Harmony, why do all your dollies have band aids on their hands and feet?’ I ask. ‘But, Aunney, look!’ She wanted my attention while pointing to all of her dollies. Published by Christian Faith Publishing, Debra M. Kelley’s new book is a beautiful reminder of how children can powerfully illustrate the most profound truths in the simplest ways. Just like Aunney in the story, parents everywhere will be moved to tears by how Jesus speaks to all through the innocent actions of his beloved little ones. View a synopsis of “Aunney, I Need Band-Aids!” on YouTube. 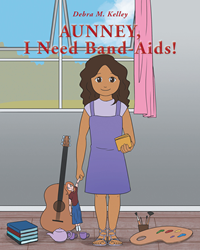 Consumers can purchase “Aunney, I Need Band-Aids!” at traditional brick & mortar bookstores, or online at Amazon.com, Apple iTunes store, or Barnes and Noble. For additional information or inquiries about “Aunney, I Need Band-Aids!”, contact the Christian Faith Publishing media department at 866-554-0919.